Located in the Chesapeake Bay, Poplar Island (above) is a flagship example of the USACE’s “beneficial uses of dredge”. Working with state and federal organizations, the USACE has been placing dredged sediments from The Port of Baltimore’s shipping channels onto the island since the mid-90’s. This practice meets the Port’s immediate need for a dredge disposal site while symbiotically creating habitats for fish and wildlife when such habitat is threatened by sea level rise, altered water ways and other anthropogenic influences. Over approximately 18 years, 40 million cubic yards of dredge material will be deposited here to create 1,140 acres of manufactured landscape. The USACE’s ever-expanding list of such beneficial uses of dredge includes the creation of aquaculture facilities, construction materials (such as fill and topsoil), decorative landscape products (sculpture, cultured stone, etc. ), parks and recreation enhancements, beach nourishment and shore protection, berm creation, landfill capping, land creation and improvement, creation of fish and wildlife habitats, fisheries improvement and wetland restoration. Below: an erosion control silt fence, a nearly ubiquitous and readily deployed land sieve, lines the exterior of a construction site. A preview of all the wickedly-good contributions to Bracket [Goes Soft] is available at the project’s site. 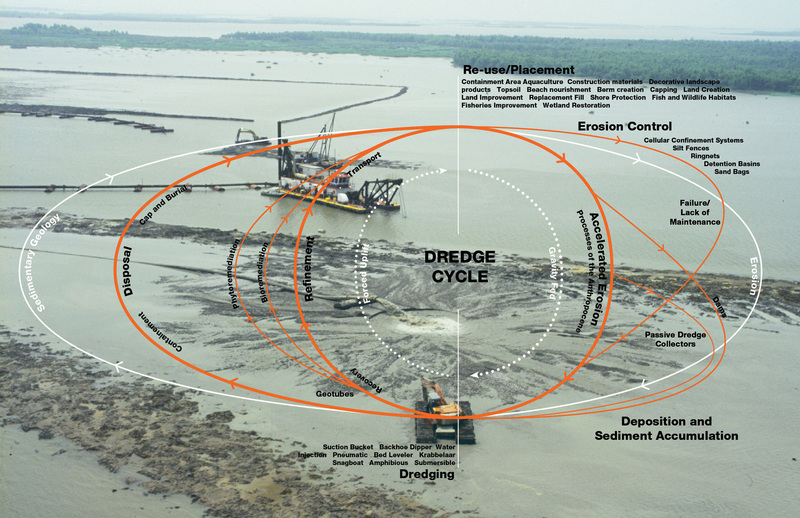 Dredge, a chapter co-authored by myself, Rob Holmes and Stephen Becker of Mammoth and Tim Maly (Quiet Babylon), situates dredging processes within the whole-scale redesign of earth’s hydrologic and geologic cycles. We allude to these assemblies of silts, sands, turbidity curtains, cutter head suction dredgers, water policies, flow models and silt fences via an organizing device we call the dredge cycle. By ‘soft’ systems we mean both the fluid materiality of sediments combined with the evolving strategies and operations that are deployed to manipulate them. We document systems of erosion control, soil transformations, sensate masses of earth, and the coupling of natural, economic, military and civilian forces. In speculating on the relations of these things, the essay articulates salient characteristics of these systemics, including responsiveness, embedded intelligence, self-organization and the Sisyphean tendencies driving the cycle’s ever-expanding agency.